The Yellow Vests in France are a politically heterogeneous movement. Yet within this space a libertarian municipalist movement is mobilizing itself. Below is an English translation of this original statement from Les Gilets Jaune de Commercy (Yellow Vests of Commercy) circulated by Pierre Bance. NO TO RIP OFF! LONG LIVE DIRECT DEMOCRACY! For nearly two weeks the movement of yellow vests has brought hundreds of thousands of people in the streets all over France, often for the first time. The price of fuel was the drop of diesel that set the plain on fire. The suffering, the enough-is-enough, and the injustice have never been so widespread. Now, all across the country, hundreds of local groups are organizing themselves in their own different ways. But now the government, and some parts of the movement, propose to appoint representatives for each region! That is to say a few people who would become the only “interlocutors” to public authorities and summarize our diversity. And that’s what scares the government! Because he knows that if they begin to give in on taxes and fuels, they will also have to back down on pensions, the unemployed, the status of civil servants, and all the rest! They also knows VERY WELL that they risk intensifying a GENERALIZED MOVEMENT AGAINST THE SYSTEM! 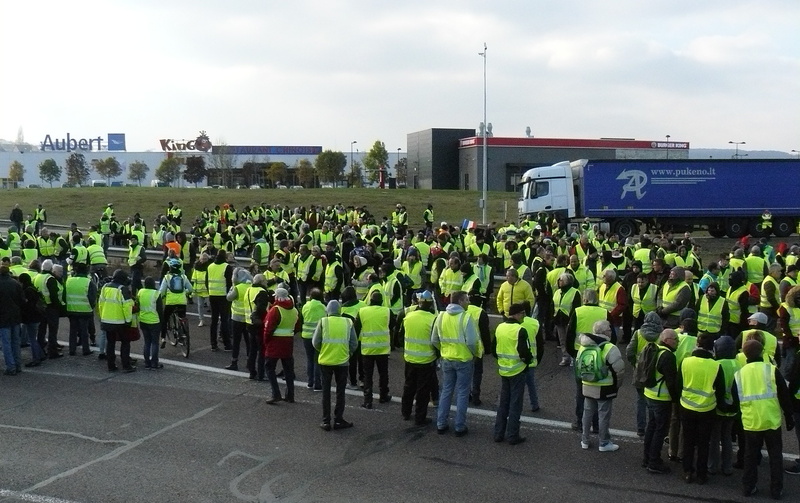 And above all, there is a very important thing: everywhere the movement of the yellow vests demand in various forms, something that is well beyond the purchasing power! This thing is power to the people, by the people, for the people. It is a new system where “those who are nothing” as they say with contempt, regain power over all those who stuff themselves, over those who rule, and over the money powers. It’s equality. It’s justice. It’s freedom. That’s what we want! And it starts from the grassroots! Let’s not put our finger in the gear of representation and hijacking. This is not the time to hand over our voice to a handful of people, even if they seem honest. They must listen to all of us or to no one! From Commercy, we therefore call for the creation throughout France of popular committees, which function in regular general assemblies. Places where speech is liberated, where one dares to express oneself, to train oneself, to help one another. If there must be delegates, it is at the level of each local yellow vests people’s committee, closer to the voice of the people. With imperative, revocable, and rotating mandates. With transparency. With trust. This is how we will win, because that, up there, they are not used to manage it! And it scares them a lot. We will not let ourselves be ruled. We will not let ourselves be divided and bought off.